At the end of January, ADT announced a significant shift in the direction of its marketing efforts. The company has traditionally focused its marketing efforts on how ADT monitored home security can help customers during crisis situations, such as fires, burglaries or carbon monoxide leaks. But according to ADT’s recent announcement, the company is now shifting its focus away from emergencies and drawing attention instead to the common security concerns that plague homeowners on a regular basis. ADT’s new campaign, “In My Mind’s Eye,” focuses on how ADT can provide consumers with the peace of mind they desire on a daily basis. Advertisements centered on this theme have already been released through television and radio channels. Social media advertisements will be released in mid- February. One commercial features a husband and wife out on a date night, trying to enjoy a relaxing evening together. However, the wife can’t remember for sure if she locked their home’s back door, prompting her husband to imagine the worst possible scenario and envision his prized possessions being stolen. Fortunately, the couple has trusted ADT’s remote monitoring product, ADT Pulse® Interactive Solutions, to help them keep in touch. So instead of spending the rest of the evening worrying, the husband simply pulls out his smartphone and uses ADT Pulse to remotely lock the back door. This simple scene illustrates how ADT Pulse can help ease the minds of homeowners on a regular basis. According to Tony Wells, ADT’s senior vice president and chief marketing officer, “ADT has built its legacy on protecting what our customers value most: kids, family, pets, loved ones and livelihoods.” Wells believes that the new ad campaign will strike a chord with homeowners who live busy, on-the-go lifestyles and have to deal with the everyday worry of whether or not their homes remain secure in their absences. Arnold Worldwide, the company behind the new ADT campaign, says that their marketing research demonstrates that homeowners regularly experience a low, consistent hum of worry whenever they are away from home. This new ad campaign aims to remind consumers that ADT monitored home security can help ease the concerns of homeowners on an everyday basis, in addition to providing invaluable assistance in the event of an emergency situation. 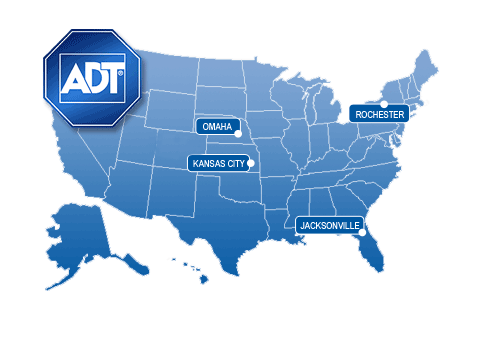 ADT is the number one monitored security provider in North America and has been helping protect homes and businesses for more than 100 years. Thanks to ADT Pulse, homeowners can now keep in touch with their monitored home security systems whether they are relaxing at home or traveling across the country. Consistent with the message of ADT’s new marketing campaign, these remote monitoring features can offer homeowners peace of mind, 24 hours a day, 7 days a week.